Though Hollywood, California’s Rusty Eye have been in existence since the mid-90s, the power-trio’s brand of horror-influenced prog/thrash is still somewhat of an underground phenomenon. With the release of Possessor—their third LP proper—it seems as if Rusty Eye are beginning to make some headway, even garnering the attention and contribution of legendary Goblin-mainman Claudio Simonetti on the tracks “Mondo Cane” and “Wings of a Demon”. The current lineup of Rusty Eye came together in 2006 with Baron Murtland joining the band correct? 3. Rusty Eye- mondo cane. 5. Isis- stone to wake a serpent. 6. Pelican- embedding the moss. 7. Lazarus A.D.- every word unheard. 8. Vektor- forests of legend. 9. Novembers Doom- into night´s requiem infernal. 11. Thanatos- they feed on fear. 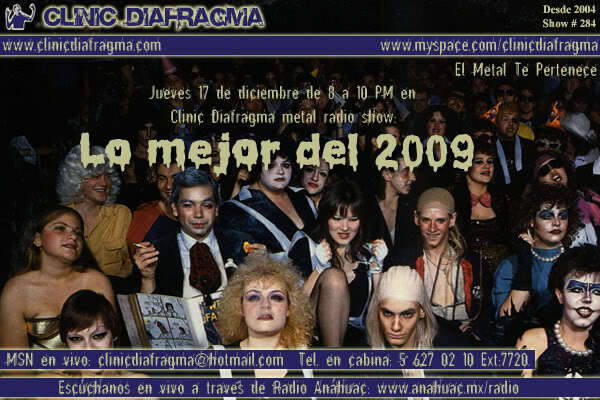 “Somnambulist Possession” makes “Top 20 Songs of 2009” list from Johnny Orlando Jr’s Antibiotic Resistant Metal Show. Greetings, Johnny Orlando, Jr. here with the definitive top 20 songs of 2009.